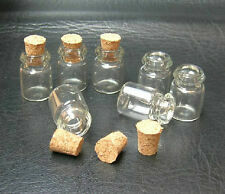 Wholesale Lots of 50 Pcs 0.5ml Tiny Small Clear Cork Glass Bottles Vials 11x18mm. Material: glass. This international order may take longer to arrive. Quantity: 50pcs ( 50 corks included ). (Capacity: 2ml. Stopper Material: Butyl Rubber. 1) Good quality with butyl rubber stopper which is clean and also stable. Item included: 10x Glass Bottles with Rubber Stopper. 3) The bottle is suitable for pharmaceutical preparations, freeze-dried powder, etc. Capacity: 100ml. Material: glass, cork. 1 Glass Bottle with Cork. You can also use it to decorate festivals such as Christmas decoration. For storing desert, make your DIY food look more delicate and yummy. 10x Bottles. The cute little glass bottles are perfect for various crafts. Detailed Size:22mm(Length)×11mm(Width). Great for lip balm, beard balm, paw wax, lotions, essential oils products. 24 x Round Cans. Made of Aluminum. Material: Aluminum. Color: Silver. Height: 2.5cm. I send goods within 12 hours. Usually I will respond in 24 hours. Capacity: 3ml. Suitable for: stash Jar Potion or daily use as sample bottle, reagents bottle, etc. Item included: 16 x 3 ml clear glass bottle. Bottle Mouth ID: approx. Material: Glass & Plastic. Color: Clear & Black. It's a magic pill that can heal your bad mood; it's a nice gift to send to the ones you love. Color; as shown in the pictures and wil be sent randomly. There is a piece of blank paper inside the pill, you can write whatever you would like on it. There is a blank piece of paper inside the pill, you can write whatever you would like on it. Paper size: Approx. Material: Plastic Paper. 1set(10pcs) x Bottle Cap with Cork(other accessories demo in the picture is not included.). Quantity:1set(10pcs). Material: Borosilicate Glass Cork. Size : 10x18 mm/0.39x0.71" (Not include the length of cork). There is a piece of blank paper inside the pill, you can write whatever you would like on it. Your feeling, your secrects, the words which you would not like to say directly can be written here. It's a magic pill that can heal your bad mood; it's a nice gift to send to the ones you love. Capacity: 2ml. Material: Low borosilicate glass (matching butyl rubber stopper). Uses: pharmaceutical preparations, freeze-dried powder, vials, bottles of penicillin. Color: colorless, transparent. 10x Glass Bottle. Material: PE. There is a blank piece of paper inside the pill, you can write whatever you would like on it. Light String Total Length:220cm/86.6". This is a Rose Flower battery fairy string light, total 20 LED bulbs with clear cable and battery box.